A heart attack is caused by a sudden stoppage of blood flow to your heart muscle. If the blood flow is not quickly restored, the heart can be permanently damaged. A heart attack needs prompt medical attention, otherwise it can cause chronic health issues or potentially death. The main blood supply to the heart muscle is via coronary arteries. These arteries are prone to being narrowed due to a build up of fats within their walls. This is known as atherosclerosis, or cholsterol plaques. If there is widespread or significant atherosclerosis within the coronary arteries the condition is known as coronary heart disease. Coronary heart disease increases the risk of developing a heart attack. The plaques can spontaneously rupture, triggering a blood clot to form on its damaged surface. If the blood clot gets big enough, it can completely block your coronary arteries, causing a heart attack. 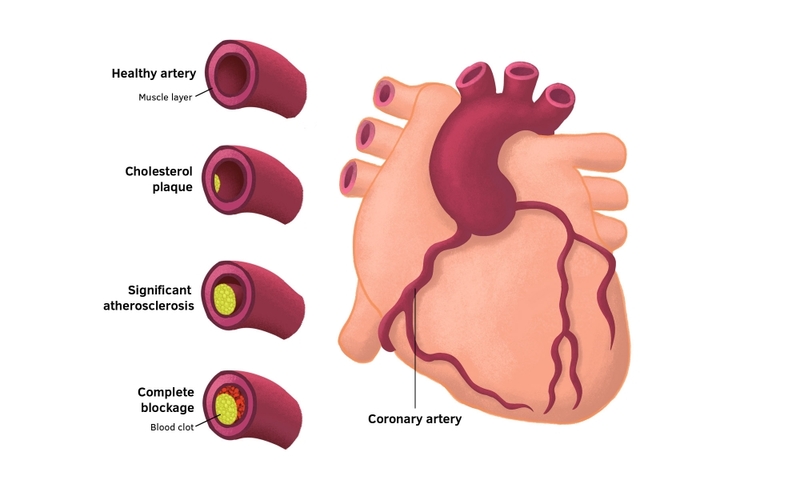 The different stages leading to a coronary artery blockage and heart attack. Personal or family history of vascular disease, such as angina or heart disease. Symptoms of a heart attack can vary. Some individuals with a heart attack may report severe chest pain, while others may only experience indigestion. If you have diabetes, are elderly or have high blood pressure (hypertension), you may not even notice any pain. A common sensation is the feeling that "an elephant is sitting on the chest”. If you have angina, the symptoms of a heart attack may be similar but more severe, last longer or not respond to treatment. If you are unsure if you are having a heart attack, do not delay, call an ambulance straight away. The longer you wait, the greater your chances of complications. Your doctors will run a series of diagnostic tests to confirm the suspicion of a heart attack. While these tests are being performed, you will also be given some treatment to make you more comfortable, such as oxygen, pain-relief medications, and medications to help improve blood flow to the heart muscles. 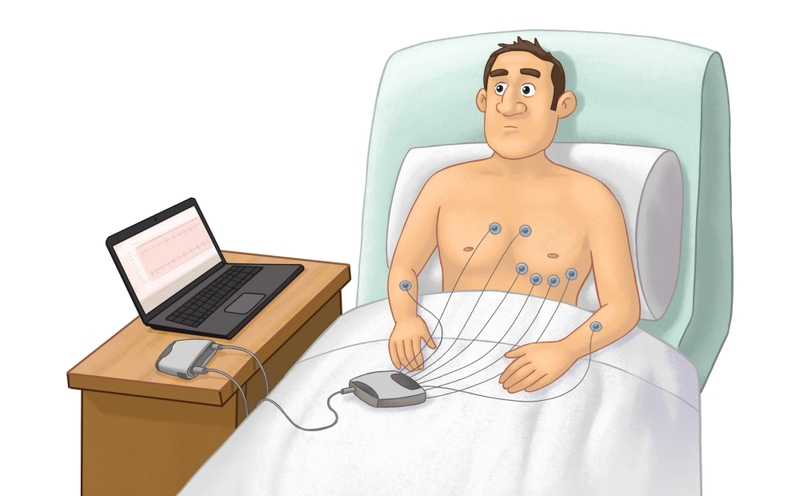 Electrocardiography (ECG) uses electrodes attached to your chest to check your heart rhythm. The beat of your heart is caused by coordinated electrical currents through its cells. This test is used to determine if there are any abnormalities in your heart rhythm. During a heart attack, certain areas of your heart may be damaged. The ECG can tell your doctor if this is likely to have happened. Electrocardiography procedure to monitor your heart rhythm. A cardiac enzyme test is a blood test – the most commonly measured enzyme is troponin. Damage to the heart, such as that caused by a heart attack, releases cardiac enzymes into the bloodstream. Blood may be taken multiple times as it can take several hours for this test to be positive after a heart attack. If you have chest pain, your doctor is likely to order a chest X-ray. This can exclude other causes of chest pain and also determine if you have a build-up of fluid on your lungs due to your heart attack. Echocardiography uses ultrasound waves to create an image of the heart. It allows your doctor to see the size of your heart and also how well it’s working. It can indicate how hard your heart is pumping blood, whether there is heart valve leakage and highlight areas of damage. An echocardiogram is not usually performed immediately, but in the days to weeks after a heart attack. A coronary angiogram involves a thin catheter being inserted into one of your major arteries in your groin or arm, a under local anaesthetic. The tip of the catheter is manoeuvred to near the coronary arteries, where radioactive dye is injected to highlight the coronary arteries, using X-rays. Any blockages or narrowing in the coronary arteries can be viewed. Prompt diagnosis and treatment is essential for limiting the amount of damage to your heart. Treatment begins at the initial suspicion of a heart attack. This may include oxygen, pain-relief medication, aspirin (to thin the blood and prevent further blood clotting), and nitroglycerin (to reduce stress on the heart and improve blood flow through the coronary arteries). You will be closely monitored to recognise any complications at the earliest opportunity. Coronary angioplasty is a procedure that can be perfomed at the same time as a coronary angiogram. If a blockage or narrowing is diagnosed on the angiogram, specialised catheters can be used to enter the coronary arteries. These catheters are able to extract blood clots or dilate narrowed arteries to restore blood flow. A self-expanding stent can also be inserted, through a similar catheter, to keep the arteries open. A coronary artery bypass graft (CABG) is a type of open-heart surgery, designed to bypass narrowed blood vessels and increase blood flow to certain areas of the heart. The operation involves using healthy veins or arteries taken from another region of the body, to replace narrowed, blocked or diseased coronary arteries. This procedue is done a under general anaesthetic and can take several hours to perform. Medications, called thrombolytics, can be given as an injection to break down the blood clots that caused the heart attack. This medication is generally used in hospitals that lack the facilities to do angioplasty. Medications, called anticoagulants, such as heparin or low-molecular weight heparin, are given to help prevent the formation of further blood clots. Anticoagulant medication is generally continued for a few days after the initial heart attack, where the risk of further heart attacks is greatest. Statins, which reduce the amount of certain cholesterols in the blood. Cholesterol is linked to atherosclerosis and coronary heart disease, so managing cholesterol levels can help protect against further heart attacks. Any damage that occurred during a heart attack can leave scar tissue. This scar tissue can cause electrical instability in your heart, leading to irregular heart rhythms, known as arrhythmias. Generally arrhythmias can be treated with medication and are often short-lived. However, some arrhythmias need to be managed with an implantable cardiac pacemaker and/or defibrillator (ICD), which is a small electrical device surgically placed in your chest. Once implanted, a pacemaker can help maintain a minimum heart rate, and a defibrillator can automatically shock the heart, should there be a dangerous or chaotic arrhythmia. If your heart was badly damaged during a heart attack, it may mean that your heart cannot pump enough blood around your body to prevent fluid build up. This is called heart failure. Heart failure is treated with medications to help it pump more effectively and prevent fluid retention. Cardiogenic shock is a serious complication following a heart attack. It occurs when your heart muscle has been so badly damaged it cannot provide blood for many of your vital functions. Treatment may involve medications to raise the blood pressure, surgery to fit an intra-aortic pump, or coronary graft bypass. If your heart valves are damaged during a heart attack, it can lead to serious leakage by the valve and in severe cases, death. Valve replacement surgery can rectify this situation using animal or artificial valves. You may need to take blood-thinning medications for the rest of your life, depending on the type of valve used. A heart rupture is a serious complication after a severe heart attack. It occurs when your heart walls, valves, or muscles split apart. Treatment is usually surgery, but the outlook tends to be poor in this situation. Many people will continue to live active and fulfilling lives after a heart attack, although you may have chronic health issues that are likely to need ongoing medications and medical follow-up. It is perfectly natural to feel anxious about getting fit again, but it is the best way to avoid having a repeat attack. Cardiac rehabilitation programs are designed specifically around your personal health circumstances and will start before you leave hospital. The idea of these programs is to gently help you raise your fitness level, while providing you with good advice on becoming a healthier person. Having had a heart attack puts you at much greater risk of experiencing another, or developing a sudden fatal heart arrhythmia. Actively working with your doctor to adopt a heart-friendly lifestyle and reduce coronary heart disease will increase your chances of leading a full life. Getting your family or friends involved - suggest a daily walk or leave the car at home whenever possible. Most of all enjoy the process – getting fit will greatly reduce your chances of having another heart attack.